This is another instance in which the identification of the bird was a real "mystery", - at least for a while. 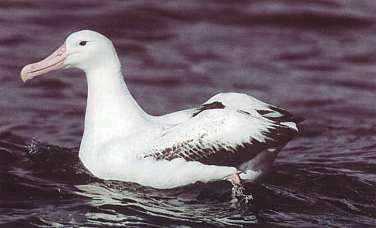 It was one of two great albatrosses seen and photographed on the Portland pelagic in August 1999. 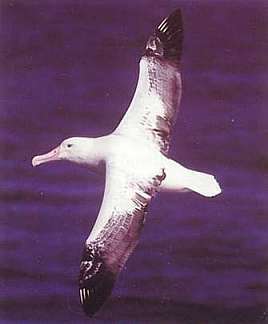 Because of the great extent of white in the plumage and total absence of black in the tail, (see the flight picture by Tadao Shimba), many aboard initially reckoned the bird was probably a Southern Royal Albatross Diomedea epomophora epomophora. 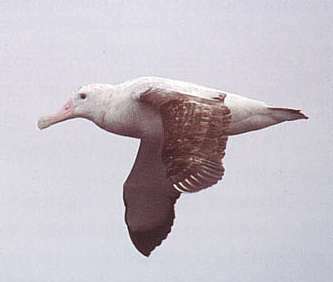 Others suggested it might be a stage 7 Wandering Albatross D. exulans chionoptera, pointing in particular to the head shape and the brilliance of the pink bill. Most Royals in Australia have a horn coloured bill. 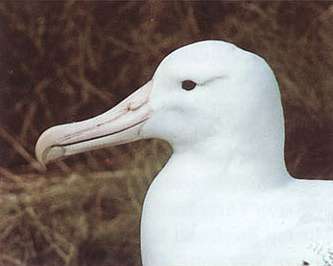 When the bird approached closely, those favouring Royal Albatross were encouraged by the presence of a black line along the cutting edges of the upper mandible (tomia). This is visible in my photograph of the bird on the water and is a character considered diagnostic of Royal Albatross and, according to the literature, the best recognition feature for sitting or standing birds at close range. But the line was weak and narrow. Compared with most Royals, it was relatively inconspicuous. Nevertheless, I have seen Royals which totally lacked black on the tomia, so its lack of prominence was not greatly significant. Thus, whilst the pinkness of the bill suggested Wanderer the black tomia suggested Royal, so other characters were used to resolve the dispute. To me, the head shape was diagnostic of Wandering Albatross. That is, the conjunction of the head and bill was relatively steep, more abrupt, less inclined than it is in Royal Albatross. In the Royal, the ridge of the culminicorn runs into the forehead well aft of the gape whereas in the Wanderer, it is approximately level with the gape. On the lower mandible, the feathering at the base projects further forward on the Royal than it does on the Wanderer. The combination of these features creates a more inclined head/bill conjunction which is noticeable at considerable distance. See Figure 1 below for the difference and compare with all the photographic references you can access. You can start by comparing the photographs of both species provided here. If you find a reference that describes this distinction please advise. I don't know of any! We worked this one out back in the 1960's and 70's when Royals were virtually unknown in Australia. Those of us sea-watching from Cape Schanck in Victoria, detected a few Northern Royal Albatrosses D. e. sanfordi, identified at distance by the pattern of black on the upper and underwing. Not only was the plumage distinct but so was the head shape. It was sleeker and longer-looking than Wandering Albatross with an apparently shallower slope of the forehead. We then used this head/bill profile to detect Southern Royal Albatrosses, later confirming the difference with close views of birds at sea. Those not yet convinced of the identification, should look at another feature; the form of the nostril. The photo clearly shows that, relative to the long axis of the bill, it points obliquely upward. This is diagnostic of Wandering Albatross. 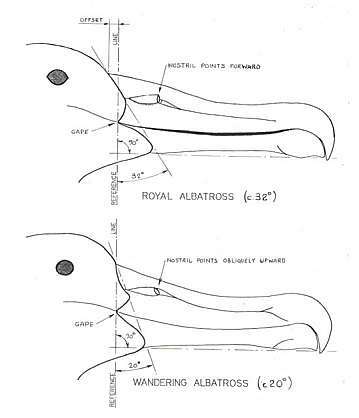 In Royal Albatross, the nostrils point forwards. It is interesting to note that the more abrupt head/bill conjunction (c. 20º) is shared by all members of the Wandering Albatross complex including D. e. exulans, gibsoni, antipodensis and amsterdamensis (Amsterdam Albatross). Both forms of the Royal Albatross, Southern D. e. epomophora and Northern D. e. sanfordi, have the more inclined conjunction (c. 32º). This is yet another example of where structure is more important and reliable than morphological characters. Unfortunately, structure is more difficult to describe than colour or pattern. It is better conveyed by illustration. Some say it is more subjective. I disagree.